This portrait of an impressive-looking Colonel Sir John Jones KCB of the 60th, The King’s Royal Rifle Corps, is on display in that part of the Museum covering the Indian Mutiny (1857-59). It is a relatively small portrait, 35 cm wide by 44 cm high, which appears to have originated as a photograph which has been painted over with a thick paint – oil or gouache. The person who did this (artist) is unknown, although it must have been done with Colonel Jones’s knowledge as below the framed portrait is an inscription stating, seemingly in John Jones’s hand-writing: ‘From yours sincerely John Jones Col 1st Btn 60th R Rifles’. After progressing through the officer ranks of the 60th to lieutenant-colonel, John Jones commanded the 1st Battalion at Meerut where the Indian Mutiny began on 10 May 1857. He continued to command the Battalion through the siege and capture of Delhi (June to September 1857) until April 1858. Nominally Jones was the second lieutenant-colonel in the Battalion and had previously been without opportunity to demonstrate his aptitude in command. However, in the space of only a few months, he gained a formidable reputation as a skilled and fearless commanding officer and leader in battle. Jones’s determination to suppress the Mutiny and his readiness to deal severely with those mutineers who fell into his hands earned him the soubriquet ‘Jones the Avenger’. Colonel Jones’s excellence in command of lst/60th was followed by promotion and outstanding success in command of the Roorkee Field Force during the Rohilkund campaign (1858) for which he received a knighthood (KCB). That, however, was the apogee of his career for he was given no opportunity to command a larger force. In later life it was always said of Colonel Jones that ‘he never encountered an enemy whom he did not defeat, never attacked a town that he did not take, [and] never had a gun pointed at him that he did not capture. 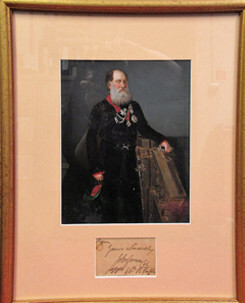 Portrait of Colonel Sir John Jones KCB of the 60th, The King’s Royal Rifle Corp.